Head, Encyclopedia of Sikhsim. Punjabi University, Patiala. BACHITRA NATAK (bachitra = marvellous, wondrous + natak = drama, play) is the name given a complex of compositions, commonly attributed to Guru Gobind Singh, the Tenth Guru or prophet teacher of the Sikh faith, assembled in his book, the Dasam Granth: hence, the name dasam (tenth) granth (book), i.e. Book of the Tenth Master to distinguish it from the earlier work, the Adi (first, primary or original) Granth, now venerated as Sri Guru Granth Sahib. The most familiar section of compositions collectively called Bachitra Natak Granth is the Bachitra Natak itself, some of the others being Chandi Chritra Ukti Bilas, Chandi Chritra, Var Sri Bhagauti Ji Ki (or Chandi di Var), Gian Prabodh, and Chaubis Autar. The composition of Bachitra Natak may have begun in 1688, at Paonta during the first spurt of Guru Gobind Singh’s literary activity. The date (Bk 1755/AD 1698) of completion of the section “Ramavatar,” as mentioned in that section, may also be that of the completion of the whole work. In any case, autobiographical Bachitra Natak must have been completed before 1699, when Guru Gobind Singh inaugurated the Khalsa Panth, for the text does not refer to the event. The poem, however, contains a detailed description of the battle of Bhangani which took place in 1688, which lays down the other end of the date, i.e. the work was completed after 1688.
his spirit merged with the Divine. Then, how despite his desire to stay absorbed in harmony at His feet, he was told by the Almighty to take birth in the Kali age to show the world the path of truth, to rid it of superstition, and to teach it to worship God alone. “Those who call me God shall into the pit of Hell be cast. I am but the slave of the Supreme Being come to watch the world spectacle.” Guru Gobind Singh adored none but God and attached no importance to any religious garb or practice except the constant remembrance of God’s Name. His own slave.” Bachitra Natak is a clear and strong statement of God’s, and Guru Gobind Singh’s role in history. That is what gives it central importance in the formation of Sikhism. Guru Gobind Singh confirmed the preceding Guru’s teaching centring on the oneness and perfection of the Absolute. Such oneness also implied the essential perfection of creation as part of the Absolute. But creation is perfect only in relation to the Creator not in itself. To see it as self sufficient is to distort reality and convert its goodness into evil. If human life is believed to be a separate and complete affair in itself, selfishness prevails and human existence is perverted. triumph acted out by noble souls on the world’s stage and an expression of faith in future victories. It is a confident call to saints to put on arms in continuation and transformation of earlier Sikhism. Loehlin. 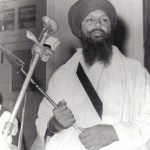 C.H., The Granth of Guru Gobind Singh and the Khalsa Brotherhood.